One Ring to Rule them All. The search for the ultimate MTB is over. Home » Riding » One Ring to Rule Them All…. Standards, standards, standards. Standards rule. Or do they? The idea of a standard in bicycle manufacture is that an agreed design is commonly adopted amongst manufacturers such that common tooling can be developed and parts can be interchanged between bikes easily. With the plethora of standards now competing, there is no longer any such thing as a true standard, just loads (and loads) of different specifications for parts with broadly similar functions. It used to be that all bikes were alike (or at least very similar). Bottom bracket shells were 68mm, handlebars were 25.4mm thick at the stem (unless you were Italian), front hubs were all 100mm OLN. But with the increasing technological complexities of mountain biking these “standards” have gone out of the window. Take wheel sizes for instance. Up until 5 years ago there was pretty much only one size mountain bike wheel you could buy: the old faithful 26 inch. It was strong, it worked, and it was ubiquitous. No-one was moaning that the 26″ wheel was destroying the fun they were having on their bikes. 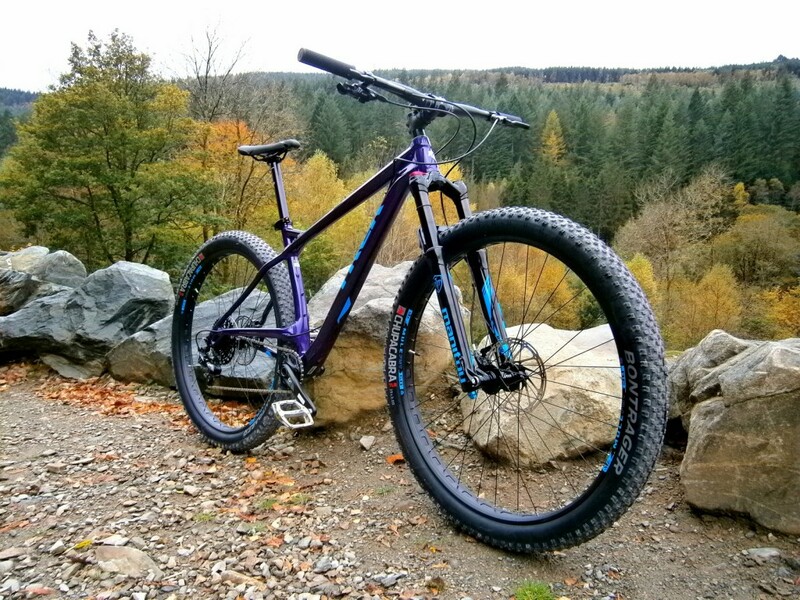 But then along came the 29er – a whole new wheel size to shake things up. It promised better rolling over the rough stuff, greater stability on technical trails, and improved traction for cornering. It could make you a whole lot better at riding! Many people weren’t convinced. They argued that a bigger wheel was bulkier, heavier, slower to accelerate, and didn’t turn as well through tight switchbacks. There was absolutely no need for a bigger wheel they said. It was just another way to make us all get new bikes. In response, the industry turned to 27.5″ (or 650b) wheels. Not a new standard, but a very old one, now re-vamped for the modern market, and aimed fairly and squarely at the 29″ doubters. It promised all the benefits of 29″ with the flickability of the 26″ wheel. They sold like hot cakes. It seemed as if the dust was finally settling, leaving the most suitable tread pattern behind. But over the last year (or two) we’ve seen the introduction of plus sizes. You can now buy 27.5″ or 29″ wheels with wider rims to accommodate extra-wide tyres: the Specialized 6Fattie runs a 27.5″ x 3″ tyre as standard, though it can run narrower tyres if needed. My new bike (a Trek Stache) has 29+ wheels. The tyres are 3″ wide and look like giant rubber rings at each end of the bike. The actual diameter of the wheels, with air in the tyres, is closer to 32 inches! One ring to rule them all – could this be the perfect wheel size? So, this begs the question: why? What’s it all about and where will it end? Are we destined to be shifting from little wheels to big wheels and then back again, and will we all end up riding 39ers? Well, some may say it’s marketing hype; that the manufacturers have to introduce new standards, new size wheels etc. just so they can keep selling us more stuff. I’m not convinced that’s entirely true. I think that at the heart of changing standards lies a desire to create the ultimate mountain bike, and I think we may have reached the end of the trail when it comes to wheel size changes. Spiritually, plus-sized wheels take us right back to the beginning of MTB. The fatter tyres add extra bounce to a bike, and with it extra fun. They remove the need for complicated and expensive suspension systems (as well as a whole lot of weight). We’ve come the point where a modern hardtail is as far away from, and simultaneously as close as ever to, the clunkers from the early days of the sport. It’s once again about a simple machine blasting along trails for the sheer hell of it. The circle has finally been squared. We now have slack-angled, short-ended hardtails, with balloon tyres to provide extra suspension as you scream down the hills. They’re light, skippy, fast, highly capable and joyful hoots of superb fun to ride. They’re also low maintenance and so make for a low-cost, year-round, mud-loving machine, requiring fewer expensive visits to your chosen suspension replenisher. So, when it comes to wheel sizes, it might just be that we’ve finally done with new standards. Like Frodo on Lord of the Rings, we’ve found one ring to rule them all, and it’s a 29+ size.